The general belief is that Internet and World Wide Web in one and the same thing and in common parlance these two terms are being used interchangeably. However, in reality these two are totally different matters though they are intimately and irrevocably interdependent. In every establishment like banks, commercial offices, educational and research institutions and any other organisation employing multiple computers, they have a network among their computers so that data and information can be exchanged within the computers hooked up with that network. Such situations are said to be a networked one and the computers can be interchangeably used. Internet is a network of many such networks all over the globe. They enable networks to “talk” within themselves and benefit from one another. It is actually one massive network spread all across the world where people can access other networks. It transmits data in packets all over to its constituent sub-networks which is available almost everywhere now. It is governed by a definite set of rules and laws which is known as Internet Protocol (IP) which enables the internet to provide information and services in the form of e-mail, file transfers, chat programs to name a few. Fig: Internet and WWW process. Now internet essentially is a huge network and therefore consists of a big collection of hardware items like many networking devices, copper wires, fibre optic cables and in some cases wireless connectivity. On the other hand World Wide Web is to be understood as the software part. In a PC there are the hardware components like key board, RAM, ROM, Hard Disk etc and there is also an Operating System which keeps the computer operational by enforcing some definite discipline for coordinating the activities. The World Wide Web is a collection of various web pages connected through hyperlinks and URLs. Thus World Wide Web is one of the services provided by the internet. Another way to distinguish between Internet and World Wide Web is the use of protocol system or suite. This is a collection of strict rules and regulations followed by both. As stated earlier internet uses IP which handles transmission in packets; the World Wide Web follows the Hyper Text Transfer Protocol (known popularly as HTTP) which handles the linking of documents, files and many other resources of the World Wide Web. Thus in World Wide Web there is no hardware coming into play and it is all software, internet is a combination of hardware and software over which the World Wide Web is positioned. 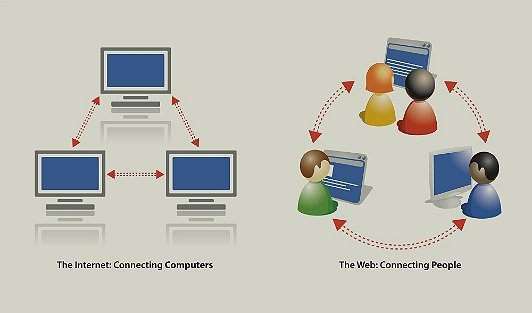 Actually as the figure depicts the internet is meant to connect networks and computers but the World Wide Web is meant to connect people i.e. the users. E-business is essentially business conducted with the help of the internet. It is also called E Commerce since many commercial transactions of yesteryear which were being done manually is now handled through the computer which not only makes the working more efficient but also more effective. Ituses the application of information and communication technologies for conducting the various activities ofbusiness like calling for tenders, receiving bids, making contacts with specific and targeted customer groups and the list is unending. Any business involves the exchange of products and services between individual businesses or simple between customers and suppliers. In the process extensive use of the internet is made and all actions which were previously being done by humans are now conducted electronically over the internet. In the traditional business the customer needed to execute most of the jobs by a variety of complicated but interlinked manual actions. Take the case of procurement. In order to procure any item the purchaser had to first short list the probable vendors and send out enquiries to them asking them to bid their best price and terms for executing the supply. After getting the offers the purchaser would have to see if the supplier was offering the correct material and at what price. A comparative chart of the offered prices had to be made manually and there after the best and most suitable offer would be selected for placement of order. Under E-Business the entire process boiled down to just sending out mails to intending suppliers asking them to give their best rates within a specified time. After the specific time got past the bid gets closed and the software makes out the comparative statement within a moment. There is no scope for deviation in the specification and even if the vendor is offering a better product at a higher price then too, that gets bypassed. The decision making is much faster and accurate since the computer cannot be bribed into making a faulty comparative statement which was a menace in the traditional method. On the flip side there is another story to tell. Since the internet is extensively used in e-business the chance of unscrupulous people – hackers – coming in to disturb the process. Hence precaution needs to be taken to ensure that the offers are from genuine suppliers and that too is free of all malicious intentions. E-Business involves much greater security hazards and risks compared to traditional methods of doing business and hence e-business users need to take adequate protection against these risks and hazards. Since, comparatively a much larger number of people (who have internet facility) have access to e-businesses the confidentiality of the transactions which was possible under the traditional manual system is lost in e-business. The major security concerns for e-businesses are in the areas of confidentiality and authenticity of data together with data integrity. E-marketplaces came into being after the internet became a very efficient and well developed platform for exchange of information. E-marketplace is a VIRTUAL marketplace where, like any other market, buyers and sellers can ‘meet’ and discuss, bargain and eventually settle a deal. The users are not aware where the actual hub is located but they know that this web based market is easily accessible to any serious seller or buyer. As just mentioned the E-marketplace is a web based information system which enables the buyer to interact with multiple suppliers and at the same time a suppliers can approach multiple prospective buyers for business. The E-marketplace takes the help of Internet technologies, its protocols and standards to disseminate data on goods and services and at the same time facilitate online transactions. No market is complete without its most visible group of people called ‘middlemen’. These people – usually called ‘brokers’ – call themselves ‘intermediaries’ in the e-marketplace and match the buyers with sellers to enable them to negotiate further and settle the deal. Usually they maintain a neutral position which ensures the building up of trust among the participants. They also lend support during some difficult transaction phases which facilitates the operations of such marketplace. They are ever trying to increase the number of users i.e. buyers and sellers in the e-marketplace. The most significant part of e-marketplace is the net benefit coming to both the buyers and the sellers. Seen by the transaction cost economics view, information technology helps to reduce transaction costs, risks, and coordinating costs of e-marketplaces. The cost of locating a suitable and competent supplier is negligible since the hunting is done on the internet. In traditional method the process is not only lengthy but also highly complicated and prone to errors. E-marketplaces can be seen either as a horizontal or a vertical marketplace. The horizontal marketplace handles a specific function (e.g. recruitment, tax advisory, auto-spares) and serves multiple customers in various industries, and a vertical marketplace concentrates on a spectrum of functions for any specific industry, e.g. chemicals, pharmaceuticals or steel. The strategic implications of the e-marketplace is that such a system is capable of reducing the costs required to be incurred by the customer for obtaining information about the quality, price, terms of payments and delivery schedules of product offers of a number of suppliers. Similarly the costs to be incurred by the supplier for communicating or transmitting information about their quality, prices and delivery schedules together with terms of payments etc. to additional prospective customers is also minimised. It is evident that the benefits enjoyed by buyer or seller in an e-marketplace increase exponentially as larger number of organizations come and join the system. It offers significant economies of scale to the participants. With all the aforesaid benefits there are some areas of concern. It requires large capital investments, participants face substantial uncertainty and above all the exit process is often very costly. "Differences between Internet and World Wide Web." UKEssays.com. 11 2018. All Answers Ltd. 04 2019 <https://www.ukessays.com/essays/internet/differences-internet-world-wide-web-1648.php?vref=1>. "Differences between Internet and World Wide Web." All Answers Ltd. ukessays.com, November 2018. Web. 19 April 2019. <https://www.ukessays.com/essays/internet/differences-internet-world-wide-web-1648.php?vref=1>. UKEssays. November 2018. Differences between Internet and World Wide Web. [online]. Available from: https://www.ukessays.com/essays/internet/differences-internet-world-wide-web-1648.php?vref=1 [Accessed 19 April 2019]. UKEssays. Differences between Internet and World Wide Web [Internet]. November 2018. [Accessed 19 April 2019]; Available from: https://www.ukessays.com/essays/internet/differences-internet-world-wide-web-1648.php?vref=1.